Aurelie Patricia Dodge Babbitt passed away peacefully surrounded by the love and comfort of family on July 18, 2011 in Mesa, Arizona. She was 80 years old. Aurelie was born December 16, 1930 in Ipswich, MA, graduated Peabody High School 1948 and graduated Boston University – Sargent College in 1952. She is the daughter of Ralph Benjamin Dodge and Laura Allan Morong of Peabody, MA. Aurelie has been a member of the American Physical Therapy Association since 1950 in the following chapters, Massachusetts, California, Illinois, New York, Hawaii & Arizona. 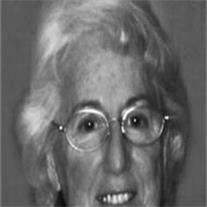 She is the first recipient of the Pauline Wampler Service Award, the Lucy Blake Service award and 1986 Physical Therapist of the Year. She was the President of the Board of Physical Therapy Examiners, associate faculty member at Arizona State University, adjunct faculty member at the University of New Mexico and advisor for the Northern Arizona University physical therapy program. She was President of the Arizona Physical Therapists Association. Aurelie started at Mesa Southside Hospital in 1968 and when the new facility, renamed Desert Samaritan Hospital opened in 1972 she developed both the physical therapy and rehabilitation services. She retired from Desert Samaritan as the director of rehabilitation services after 22 years. She is survived by her husband of 58 years Thomas Richard Babbitt USN Ret, daughter Sheryl Lee Girard, two sons Thomas Richard Babbitt II and Brent Randal Babbitt, and four grandchildren, Crystal Rae Girard Perez, Thomas Anthony Girard, Brittney Ann Babbitt, and Christopher Michael Babbitt. Memorial services will be held at Bunker Family Garden Chapel 33 North Centennial Way, Mesa, AZ at 10:00am Friday July 22, 2011.